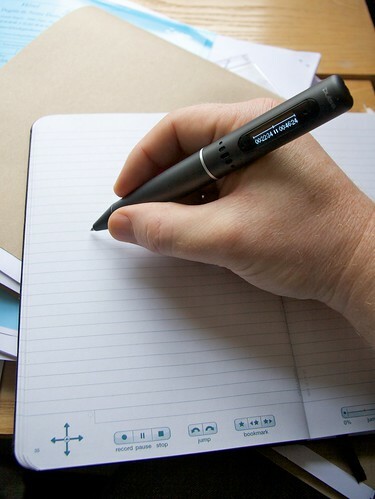 My favourite recent gadget is a Livescribe Pulse. Described in their Architecture Overview as ‘a Montblanc-sized computer’, it’s a pen which incorporates the Anoto technology – there’s a small camera which points at the tip, and a very faint dot pattern on the paper which allows it to recognise its position. The upshot is that it records what you write and can transfer it to the computer when you put it in its USB dock. The pen is aesthetically more pleasing, I think, than its predecessors. There is support for the Mac. Decidedly beta quality at present, but the 1.0 release is out on Tuesday. The coolest bit of all: it has a microphone built in. If you’re in a meeting, making notes, you can also be recording the audio. Later, you can tap on some text you wrote – or click on it if you’ve transferred it to your PC – and it will play back what was being said at the time you wrote the text. Quite brilliant. There are quite a few fun things you can do with this beyond simple note-taking, and they’ve even got an SDK so, if you want to, you can write your own ‘penlet’ applications for it. I got mine from a UK supplier, Magicomm. Livescribe have just announced another round of investment funding. They deserve to do well, I think. Update: Bother… they’ve postponed the Mac release for a month or so. Anyway, just wanted to pop in and say that I couldn’t agree with you more regarding the pen. The difference of course was that back in 90-91 you couldn’t miniaturize the signal processing and computing hardware to fit inside the pen so the design had a tethered pen and the computer was the size of an old-school Palm PDA. So it took 18 years for the technology to be made a reality. Back then people would think we’re nuts. They would ask why use a pen when you can use a keyboard.